Within the pedigree Gloucestershire Old Spots breed, there are no distinct male bloodlines. Therefore, the reduction in inbreeding must be through the female lines, hence the Cyclic Breeding System. Interbreeding must be avoided and by using this system, breeders can avoid it with ease and confidence. 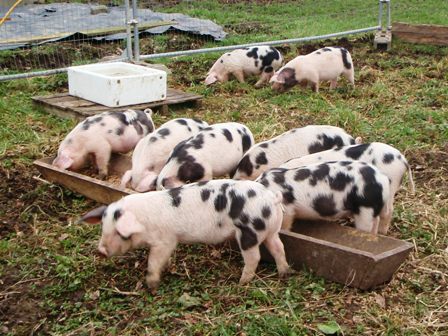 One of the original aims of the Gloucestershire Old Spots Pig Breeders’ Club is to promote the use of this system, but its adoption by any breeder is purely optional. Since its inception, the population of GOS in the UK has increased significantly and for smaller herds, it is much less important today to adopt this system. It is therefore recommended that such herds ignore Cyclic Breeding and concentrate instead on simply identifying unrelated stock when planning breeding programmes. However, if you are interested in pursuing Cyclic Breeding, you should contact the BPA. The system was adopted by Mr George Styles in the 1960s. At that time, Mr Styles’ Ribbesford herd contained about 80% of the national herd and he approached the National Pig Breeders’ Association (now British Pig Association), with the idea in order to ensure that inbreeding was limited and controlled. The system was simple and effective. The female lines in the Gloucestershire Old Spots breed are divided into four colour groups shown below. Female offspring of all GOS females are named according to the BPA bye-laws, i.e. the daughter of the female carries the same family name as her dam preceded by the herd name of the breeder. Individual pigs within the same family are distinguished by numerals after the name. The cyclic breeding system dictates that the male offspring are named according to the colour group of the boar’s dam and that the name given relates to the colour group to which he is to be mated. Thus, the male offspring of a sow in the Red group is always named Sambo, the Green group, Gerald, the Blue group, Rufus and the Black group, Patrick. On occasions when it has not been possible to stick rigidly to the cyclic system, this rule still holds true. For instance, if a Sambo boar is mated to a sow in the Green group, the male offspring are still named Gerald and mated to sows in the Blue group. Boars named under this system should then only be mated to females in the group nominated in the diagram above. Sambos are mated to females in the Black group; Gerald to females in the Blue group; Rufus to females in the Red group and Patrick to females in the Green group. It can readily be appreciated that once operating, this system is simplicity itself. A breeder can specialise in female lines from one colour group and use just one boar or a group of smaller breeders can co-operate together in keeping just one colour group and sharing a single boar. By using this system without deviation, inbreeding through the male bloodlines is minimised. One of the aims of the Gloucestershire Old Spots Pig Breeders’ Club is to promote the use of the system, but its adoption by any breeder is entirely optional. However, a clear statement is required that any breeder intending to adopt the Cyclic Breeding System must inform the BPA in writing before any litters can be notified under the this system and await their written approval. Once adopted, all litters must be named in this way. It is appreciated that some breeders will find it impractical or may not wish to operate this system in which case they need take no action but should register their pigs in the normal way, naming male offspring after the sire. 7. Register intention to use the Cyclic Breeding System with the BPA before notifying any litters using the system’s naming pattern.